As chilly weather fast approaches, now is a great time to start thinking about safe winter driving habits. In December of 2009, David Pritt from the Pennsylvania Department of Transportation’s District 11-0 office was a guest speaker for a special CommuteInfo webinar titled "Winter Driving Safety". We are happy to let you know that this entire presentation can now be viewed on your computer! Click here to watch the video. Drive Even Safer by using "Street Smarts"! Street Smarts is an educational campaign to provide safety information to commuters. As part of the campaign, five information cards were produced that provide tips on safe commuting habits. 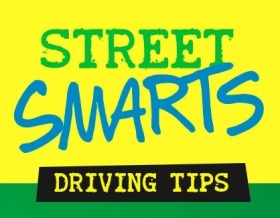 Click here to view the Street Smarts card for safe driving. If you would like to request hard copies of the Street Smarts cards, contact CommuteInfo staff today, by emailing bvillella@spregion.org or calling toll-free 1-888-819-6110. Mark your calendars, because on November 26, 2012 CommuteInfo will be featured on KDKA Pittsburgh Today Live during the Pennsylvania Resources Council’s At Home With the Environment segment. It will air between 9:00-10:00 AM. We hope you are able to tune in and check it out! Want to include CommuteInfo information at your community event or meeting? CommuteInfo staff can provide a complimentary supply of materials for your use. Contact us today!